The Great Smoky Mountains is home to a large diversity of plants and animals. 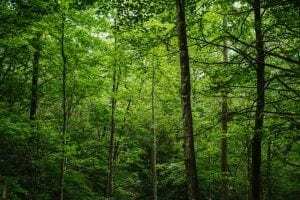 There are more than 4,000 plants, 140 species of trees, about 65 species of mammals, 200 varieties of birds, 67 native fish species, and more than 80 types of reptiles and amphibians. About 1,500 bears are said to call the Smokies home! When you’re on our zipline tour, keep your eye out for wildlife below you and admire the nature that surrounds you. 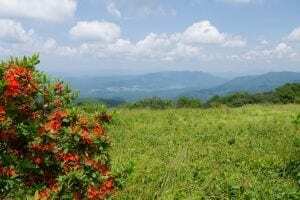 Many people know that the Smoky Mountains don’t cost a thing for visitors to explore, but do you know why? The land that is the Great Smoky Mountains National Park today was once privately owned. The states of Tennessee and North Carolina paid to construct Newfound Gap Road. When Tennessee transferred ownership of the road over to the federal government, it was stated that “no toll or license fee shall ever be imposed…” to travel the road. It’s no surprise that the Smoky Mountains is the most visited national park in the United States! There are so many things to do, from hiking, to fishing, to horseback riding, to exploring important parts of history. More than 10 million visitors come to the Smoky Mountains each year to enjoy everything that the area has to offer. Did you know that the Smoky Mountains are considered the “Salamander Capital of the World”? There are 30 different species of salamanders in the Smoky Mountains! On any given day in the park, it is safe to assume that the majority of vertebrate animals in the park, including human visitors, are salamanders. The Smoky Mountains are estimated to be between 200 and 300 million years old, making them one of the oldest mountain ranges on earth! One of the best ways to explore the Smoky Mountains (besides ziplining, of course) is to go for a hike! There are more than 800 miles of hiking trails in the national park. From frozen waterfalls in the winter to wildflowers in the spring, there is always a beautiful sight to be seen when you go hiking in the Smoky Mountains. The Smoky Mountains have about 2,900 miles of streams, all of which you can fish in! In fact, it protects one of the last wild trout habitats in the eastern United States. A majority of the streams remain at or near their carrying capacity of fish and offer a great opportunity for fishing all throughout the year. One of the best parts about the Smoky Mountains is that you never have to worry about sweltering hot temperatures! In higher elevations, like Mount LeConte, temperatures very rarely reach above 80 degrees. The Smoky Mountains are rich in history. In fact, more than 90 historic structures have been preserved or rehabilitated by the park. These include houses, barns, churches, schools, and even grist mills. 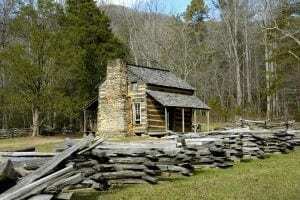 The best places to see some of these structures are Cades Cove and along the Roaring Fork Motor Nature Trail. The Cherokee word for the Smoky Mountains is “Shaconage” (Sha-Kon-O-Hey), which means the “Land of Blue Smoke.” The “smoke,” however, can better be described as a fog or a mist. The mist is formed from the vapor given off by all the vegetation in the mountains. When the vapor is released, the molecules that make up the gas scatter blue light from the sky, giving the fog its blue color. You can learn more about the Cherokees on our Mountaintop Zipline Tour. Now that you know all of these fun facts about the Smoky Mountains, it’s time to come ziplining with us at CLIMB Works to learn even more! Book your zipline adventure with us today.